Keep This Quiet! Ancient Secrets Revealed (Volume 4) by Margaret A. Harrell is a non-fiction memoir in a series by Margaret about her reminiscences and experiences. Keep This Quiet! Ancient Secrets Revealed is a pretty eclectic mix that delves into science as well as spirituality. The book is divided into a few major sections. A large part of the narrative talks about Margaret’s experiences and relationships in the 1990s living in Belgium. Some of the topics covered under the various sections are the intricacies of quantum physics and its relevance in the spiritual world, teachings and thoughts of Carl Jung including synchronicity, teachings of her guru, and some offered explanations for phenomena such as siddhis, various concepts from Eastern traditions such as yoga, Tai Chi, Kundalini, and much more. The subject matter of Keep This Quiet! 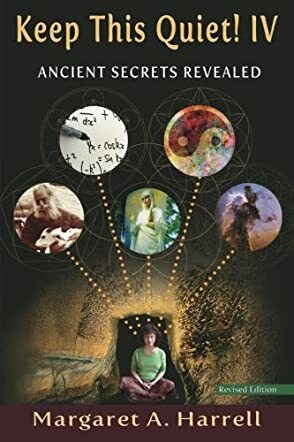 Ancient Secrets Revealed (Volume 4) is one that will interest the spiritual seeker, especially someone who already sees a connection between quantum mechanics and philosophy or spirituality. This book was a mix of Margaret’s personal experiences as well as some of the teachings from the Eastern and Western world regarding the spirit, soul, or universe. The arrangement and organization of the book could have been better as it would be difficult to pick up this book in the middle and understand it because of the mix of elements. The best way to read it would be sequentially. The writing moves at a fast pace. Overall, a spiritual seeker would be interested in reading about the experiences mentioned in this book.